Bruce Jenner spotted outside his home in Calabasas wearing a long flowing dress. As the world anticipates Bruce Jenner finally speaking out on his transitioning into a woman in an interview with Diane Sawyer on Friday, he continues to raise questions. 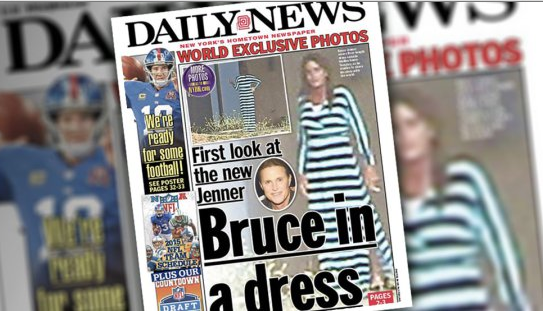 The Daily News released photos of Bruce Jenner outside his home in a long dress as he smoked a cigarette. Just more of Brucina's antics, to get people to watch that Diane Sawyer interview. His home is extremely secluded, one of the reasons he purchased it. Kris called photographers to come and take those pics and he was ready, facing the camera posing and errythang. *smh* bruce, bruce, bruce, bruce, bruce, bruce, bruce, bruce, bruce...what did that koven of witches and harlots DO to you??? that poor man done lost his damn mind! his life was cursed the minute he married that succubus named kris houghton.